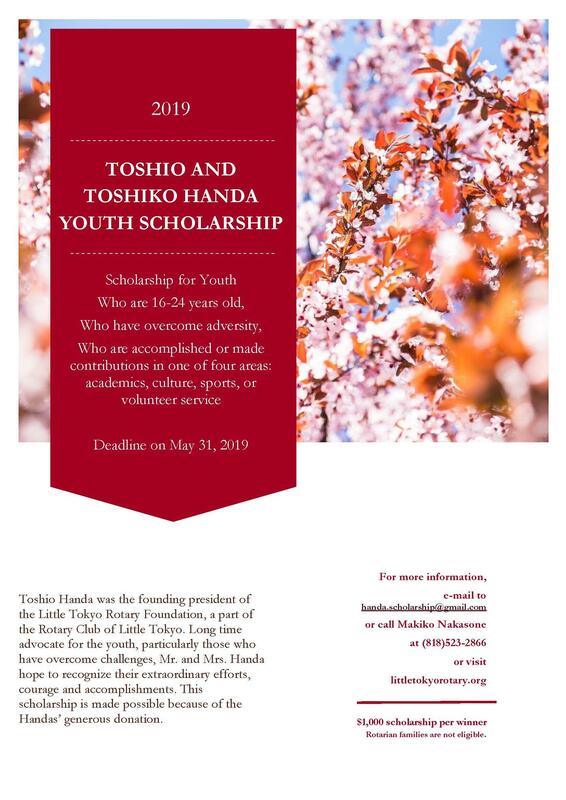 The Little Tokyo Rotary Founda tion is offering $1,000 scholarships to the youth. This new scholarship is for those who have overcome adversity and are making significant accomplishments or contributions in one of the four areas: academics, sports, culture or volunteer service. This is to recognize and award the courageous effort by the youth to overcome physical or psychological challenges, serious sickness, or loss of parent(s). The deadline for the application is on Friday, May 31, 2019. Please Click Site Pages Link above for downloading Information Files. You are all invited to the first FREE and OPEN to ALL "Rotary Community Peace Conference" at the Japanese American Cultural & Community Center in Little Tokyo, LA, on Saturday, April 14. 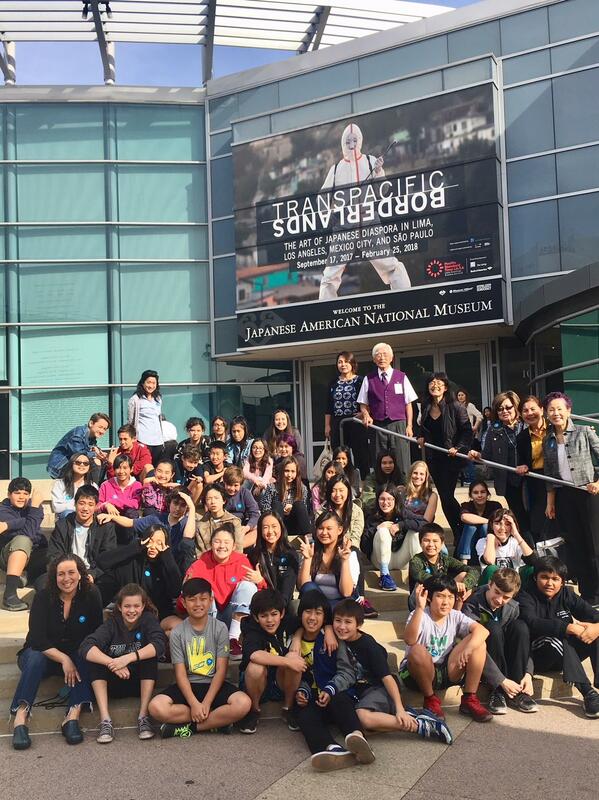 This is a finale of the year-long Peace Educational Project that the Rotary Club of Little Tokyo started last fall. Come listen to the youth how they want to be peace builders at the Peace Speech Contest. Come see all the Peace Projects that the students in the English Japanese Immersion Program of Glendale Unified School District have worked on for the last several months. Come listen to the inspiring speakers from Hiroshima, Philadelphia, Oakland, and Santa Barbara. This Peace Conference will provide you ideas how you yourselves can be peace builders, too! It was amazing to see how deeply the 3rd grade students at Dunsmore Elementary School are learning about the importance of peace. 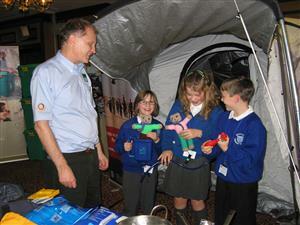 The Peace Educational Project funded by the Rotary Global Grant is making a difference for the youth. The learning does not end in the classrooms but at the school library and at home with their families. 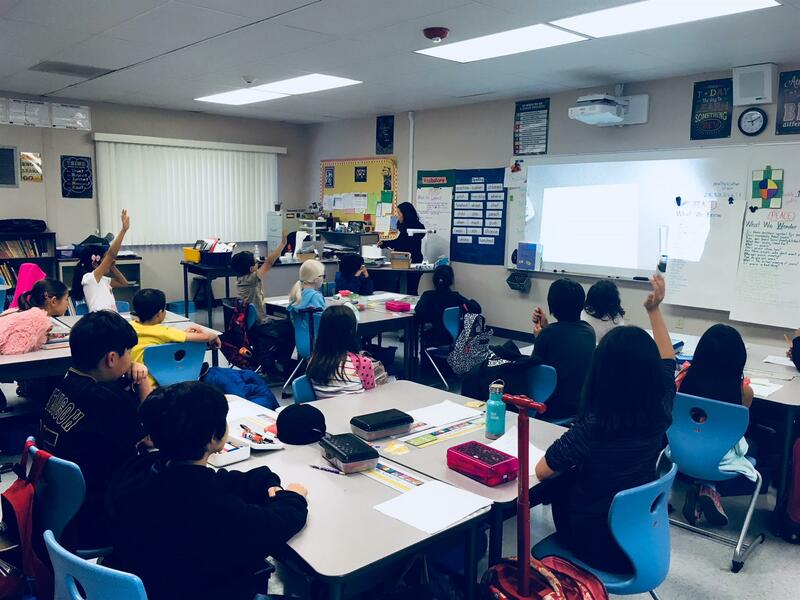 The Rotary Club of Little Tokyo hosts schools assemblies at Verdugo Woodlands Elementary School and Woodrow Wilson Middle School with Hiroshima survivor Mrs. Kikuko Otake and WWII Japanese American internee Mr. Bill Shishima on January 16, 2018. Our Get'a Tap Troup participated in Nisei Week Festival. 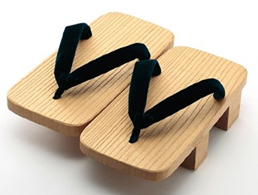 "Geta" is a pair of wooden sandals people in Japan commonly wear. When walking, they produce beautiful wooden "clack clack" sounds. So a creative Takeshi Kitano, a Golden Lion award winner, producer/actor used a scene in his famous "Zato-Ichi" movie, when farmers flash-mob'ed into a Geta Tap Dancing performance. In 2014, Nisei Week Festival picked up this performance having volunteers from Japanese business people and local community volunteers to launch a dance stage as Geta Tap Dance. Since then, "as no skill needed" volunteers are convening through several practicing to put on a show during Nisei Week Festival. Rotary Club of Little Tokyo, in collaboration of Little Tokyo Business Association are playing a center role in continuing this "new" legacy. On Sunday, May 22, 2016, we unveiled the stone monument to honor late Frances Kazuko Hashimoto at the Frances Hashimoto Plaza. Members, families, and friends gathered to celebrate this special occasion. We were also joined by Frances's son Brian Friedman and community leaders, Chris Komai, the president of Little Tokyo Community Council, and Jan Perry, former LA City Councilwoman. This project was made possible by the Rotary District Grant and the funds raised by selling the rice cooker generously donated by Japan tiger Corporation of USA. Since April, 2015, on the fourth Sunday of every month, we have been cleaning up this once neglected plaza, where planters had been used as trash bins, planted drought tolerant Rosemary, and have been maintaining the plaza. Along the way, local businesses and passers-by have recognized our efforts. The store owners on the plaza offered to water the plants daily, and La Canada Nursery donated 48 one gallon Rosemary pots, thanks to the in-depth reporting by Nikkan Sun newspaper and the blown-up photos on the windows of U & U Graphics. Our special thanks must go to Derek Furukawa of Southern California Gardeners' Federation, who from day one has been offering professional advice and never failed to come help us with the clean up. We owe Derek and Brian Yamazaki our sincerest thanks for installing the monument in a very tight schedule. They spent countless number of hours, preparing and setting the stones professionally. My personal thanks to Mike Okamoto, who is my Community Service Chair, for close communication and design of the monument. He could not join us due to his business obligations, but the fruit of his work was evident. Another thanks must go to Haru Takehana for gathering important documents to include in the Time Capsule to be open in 2066! It is placed on the right front corner of the base. The capsule includes roster of the charter and new members of the Rotary Club of Little Tokyo, maps of Little Tokyo, clippings of Rafu Shimpo, LA Times, and Nikkan Sun, roster of other major organizations of the community, etc. This was a great day, when we all felt a sense of accomplishment to properly honor the remarkable leader of this community, Frances Hashimoto! Our guest speaker tomorrow morning is Ms. Kitty Sankey, the president of the Japanese Chamber of Commerce of Southern California. She is the first female president of its almost 70 year history. Though she is an Optimist, I am sure there will be many future opportunities for us to work together. Please rise early, and join me in welcoming Kitty tomorrow! We had a birthday party for five of our members who were born in this quarter: Joyce Chinn, Chris Komai, Makiko Nakasone, Helen Ota, and Jan Perry! Though many could not make it, we had a fun Who's Who quiz and the winner who identified each member got a package of delicious Oolong tea package directly imported from Hong Kong. To know that Chris has been a dedicated Dodger fan who used to cry when the team lost and that he drives his mom's 2005 white Honda CR-V, we all felt we now know him a little better. Makiko treated everyone with the famous Porto's fruit tart to celebrate the occasion. We will hold a quarterly birthday party for our members on Tuesday, May 17. The birthday members include Joyce Chinn, Chris Komai, Makiko Nakasone, Helen Ota, Jan Perry, Sylvia Ena, Haru Takehana, and Tsukasa Watanabe. There will be a series of Who's Who trivial quiz on those members. This is a great opportunity to get to know them better. So please join me in celebrating their birthdays! Doug Erber, President of Japan America Society of Southern California, will be our guest speaker. He is one of the non-Japanese who is most knowledgeable about Japan and her culture, and who has devoted himself in bridging the two countries. This is a great opportunity to learn more about JAS, and to find out how we may collaborate in the future. We will also have three visiting Rotarians from Hiroshima, Tokyo, and Hong Kong. Please make your utmost effort to join me in welcoming these special guests! The beautiful Storrier Sterns Japanese Garden in Pasadena hosted the re-plantong ceremony of the A-bomb survived camellia tree on Sunday, May 8th. This was a project by Hiroshima Rotary Club, Yoneyama Yuai Rotary Club, and Yoneyama Yuai E-Rotary Club in collaboration with Green Legacy, a non-profit to promote peace in the world by re-planting bomb survived trees and plants. The Rotary Club of Little Tokyo supports the project, and some of us sacrificed Mother's Day and attended this very special event. Pictured are from left to right Larry Gillham, PDG Elsa Gillham, Hiro Yokota and his wife, Yukiko Yokota, Mari Robinson, Haru Takehana, Makiko Nakasone, Weili Materna, Derek Furuta of Southern California Gardeners' Federation (SCGF), Tsukasa Watanabe, Ellen Sun, DG DJ Sun, and Brian Yamazaki of SCGF. There were also Koto performance as well as the tea ceremony by Omote Senke school of tea. It was a beautiful ceremony, which provoked many thoughts on peace. 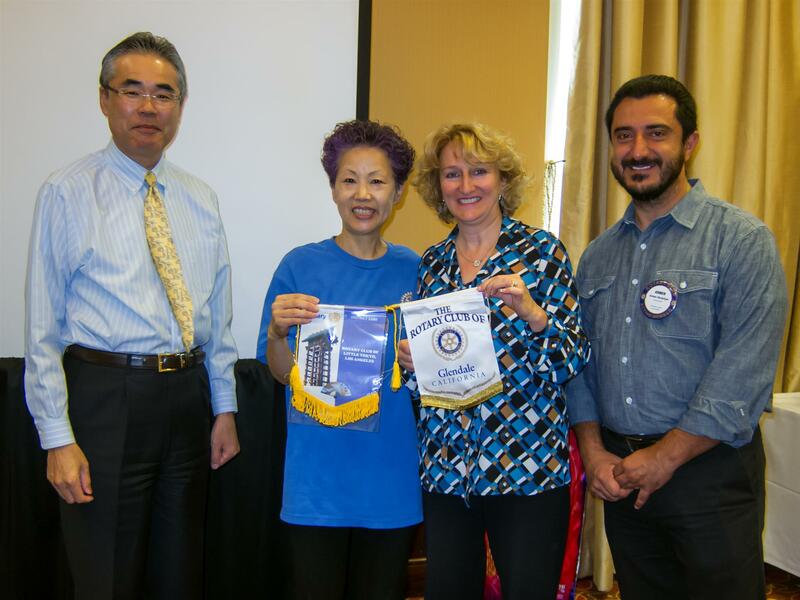 Hiro Yokota and Makiko Nakasone were very warmly welcomed by the Glendale Rotary on April 28. We could thank the 45-member club in person for their generosity to sponsor our club, send PDG Chuck Reinhart as our mentor, and purchased our 4-Way Test banner. We exchanged the club banners with President Armen Khalafyan. One of the inspirational moment is when the long-time Rotarian and the most generous member, Sam Carvajal, stood up after the presentation by representatives of the Healthy Start, a Glendale Unified School District's department which serves the homeless and foster care students. Sam proposed, "Let's donate to Healthy Start. I will match ever dollar!" In the next 5 minutes, more than 10 members raised hands, donating $100 each. With Sam's matching, they donated more than $2,000! Eleven members and friends got up early again and gathered at the Frances Hashimoto Plaza for our monthly beautification project on Sunday, April 24! For many, this was the second weekend clean up in a row, but we were all happy to see the end results. Our Community Service Chair/VP/President-Elect, Mike Okamoto, brought his impeccable drawing of the stone monument we are planning to install to honor late Frances Hashimoto at the plaza. After the clean up, our own Yokko-san and her husband/designated photographer, Hiroyuki-san treated us with tasty coffee and sweets. Thanks always for your kind hospitality! Pictured are from left to right are Mari Robinson, Makiko Nakasone, Weili Materna, Yokko Ueda, Joanne Kumamoto, Collin from Sustainable Little Tokyo, Collin's mom, Derek Furukawa, Collin's dad, Mike Okamoto, and Hiro Yokota. Not pictured are Hiroyuki Ueda and Tomomi Kanemaru of Nikkan Sun newspaper. It is terrible to hear about the earthquakes in Kumamoto and Rotary Club of Little Tokyo express sincere sympathy to those we were affected by them. We are currently collecting your kind donations to the victims. If you would like to make a donation, please make your check payable to the Little Tokyo Rotary Foundation and give it to Yokko Ueda, the foundation treasurer. Rotary Day of Service at the LA River was successful. There were 15 club members, families, and friends. Everyone enjoyed the day. Thanks, Mike, for organizing the group! Frances Hashimoto Plaza Monument project is making progress. Mike showed the design and reported that we picked up 3 stones and a granite plaque. Wording for the plaque is being finalized with JACCC and Hashimoto family. FHP beautification project is on Sunday, April 24 from 9:30 am to 10:30 am. We will have a Spring Social for the seniors at the Little Tokyo Tower on Wednesday, April 27 from 11:00 am. Lumbini preschool children from Higashi Honganji will sing TWO songs!! We will be dark next Tuesday as we will have a joint meeting with Glendale Noon club on Thursday, April 28 from noon to 1:30 pm at the Embassy Suites in Glendale. District Conference will be from April 28 to May 1 at the Hilton Hotel Mission Bay. District Assembly in Carson Community Center from 7 am to noon on May 14: new board members and officers for the next Rotary year are encouraged to attend. Club Runner demonstration: President Makiko showed contents and function of our webpage: http://littletokyorotary.org/Please visit the website! If you have technical issues, please call toll free 877-469-2582 by 2pm as the service center is located in Toronto. We will be visiting Glendale Rotary on Thursday, April 28th, from 12 noon until 1:30 pm at Embassy Suites by Hilton Los Angeles--Glendale on 800 N. Central Ave. in Glendale. This will conclude our official thank you visits to our sponsor clubs, which not only shared their valuable members as our mentors, but also donated our big Club Banner, 4-Way Test Banner, and the beautiful bell. Many also purchased the Tiger rice cookers to support our first fundraiser. The three course lunch is $27, including the underground self-parking with validation. Glendale Rotary is the club I used to belong to, and it is an active, welcoming club with many dedicated members. You will enjoy meeting them. Some of you may remember PDG Chuck Reinhart, who came to our meeting last year to share his Rotary moments, and who made the short and sweet toast at our inauguration party at the Japanese Consul General's official residence. Please let me know who can accompany me to Glendale. Let's show our gratitude in a big way to their warm, generous support to our club! Kudos to our Community Service Chair/PE, Mike Okamoto, for recruiting as many as 15 club members, family members, and friends to participate in the Rotary Day of Service on Saturday, April 16. I think our club had the most number of participants in the District! The L.A. River near the Sepulveda Sports Complex in Van Nuys became so clean, and we all felt really good. Those who sacrificed their beautiful Saturday morning to come for the clean up are: Mike Okamoto, Hiro Yokota, Weili Materna, Sylvia and Yoshi Ena, Joyce and Greg Chinn and their friends, Connie Yuhara, and Brian Ikeda, Chris Komai, Miyako Hotel's Keiji Kobayashi and his entire family, Ayaka, Kaeru, and Mahiro, and myself. Sorry, I seemed to have missed the group photo, and could picture just five: (from left to right) Weili Materna, Brian Ikeda, Connie Yuhara, Joyce Chinn, and Makiko Nakasone. Well, it is the website managing company that most of the Rotary Clubs use, with which we can send e-newsletters, mass e-mails, and manage club operations besides having a website. And we recently decided to sign up for their service. So when you google "Little Tokyo Rotary Club," you can find our website! Have you been enjoying receiving the weekly e-newsletters? I know some of you did not bother to read it or deleted it at the beginning because you did not know that it was from me. Though we are still trying to make the website and the newsletter more attractive and effective, I thought it would be very helpful for you to learn how to use the site. It will be a beginner's workshop, but I guarantee that you will enjoy learning about it! So please join me tomorrow at 11:45 am at our old Far Bar! Trying to beat the morning cross town traffic, several members became early birds and made it to the last quarterly District Breakfast at LAX Westin on April 5th at 7 am. We love the friendship with other Rotarians in the district, but also wanted to show our support to the Interact and Rotaract students, the next generation Rotarians, who were emcees and organizers of the breakfast. The room was packed with more than 300 attendees. Our club was again recognized as one of dozen clubs which inducted new club members this Rotary year. We welcomed a total of five new members so far, a net gain of 25%. Shown in the picture from left to right are Makiko Nakasone, Joyce Chinn, Mari Robinson, and Mike Okamoto. Attended but not shown in the photo are Sylvia Ena and Jan Perry who had to leave early for work. As you may see, some of us purchased Rotary backpacks to support the Interact abd Rotaract students who are already planning for next year's humanitarian trip! Shinkichi Koyama, past President of Southern California Gardeners' Federation and 2015 recipient of the Japanese government's Order of the Rising Sun, will be our guest speaker tomorrow. This is a very special opportunity for us to be able to listen to the history of the federation, which has been the backbone of the Japanese American community. You do not want to miss this chance to learn first hand the contribution and dedication the gardeners in Southern California played for the prosperity and growth of our community both culturally and economically. See you at 11:45 at Far Bar! Please join us at the last quarterly District Breakfast tomorrow at LAX Westin Hotel on 5400 Century Blvd. from 7-9 am. The speaker isRamu Damodaran, Deputy Director for Partnerships and Public Engagement in the United Nations Department of Public Information (DPI) and Chief of the United Nations “Academic Impact” initiative. He is flying into LA just for us from NY. Don't miss this rare opportunity to listen to one of the most important education leaders today. Separately, this breakfast is organized by Interact and Rotoract students. Let's show our warm support for the Rotary youth by attending the event. The cost is $22 per person with a $20 club subsidy. The joint meeting with Burbank Sunrise was a big success on 3-29-16! Some of us became early birds, attended their 7:15 am meeting at the Burbank Holiday Inn, and were ever so warmly welcomed. We were happy that we could thank them for their generous support to our club in person. We will not forget their kindness to donate their $192 Happy Bucks earlier this Rotary year, several Tiger rice cookers they had purchased at our first fundraiser, and the banner banner they had given to us. We proudly presented our brand new club banner for exchange. This banner is the creation by all of our club members over several months, but in particular with the time and effort thrown into by Yokko Ueda, our professional computer graphics designer. The banner was a big hit. Accompanying Makiko were Tomoko Omura and Weili Materna. We will have a joint club meeting with Burbank Sunrise tomorrow at 7:15 am at Holiday Inn. It is just one block north of FWY 134 off Olive exit. The cost of breakfast is $10, including parking, though you need to make sure you get a validation. It is a small, but a mighty club with very generous and dedicated members. You will be inspired. I hope you will get to meet President Elect Ian Waterhouse, a 26 year old CPA at Disney Company, who is very young but so giving and committed to service to others, a model Rotarian! Please also remember that this is an opportunity for us to properly thank them for their kind support to our club; several members had purchased the Tiger rice cookers to support our first fundraiser. The club also donated their $192 Happy Bucks to this new club earlier this year. On top of that, they presented us with a banner banner which we will display the club banners we will be exchanging with other clubs not only in the States, but also in other countries. Tomorrow is the fourth Tuesday, but we will not be meeting at Far East Lounge tomorrow. FH Family Visits Our Beautification Project! At our monthly beautification project at Frances Hashimoto Plaza yesterday, we were delighted by the visit of Ryan Friedman, the son of late Frances Hashimoto, and his finance, Sharon Im. We were happy that we could personally show Ryan and Sharon what we had been doing to express our gratitude and respect to one of the most respected community leaders, late Frances. Even though it was Easter Sunday, 15 members and friends showed up to clean the plaza, and water the Rosemary we had planted. Sown in the picture from left to right are: Weili's friend, Kumiko Nakamura, Mari Robinson, Hiro Yokota, Yokko's husband Hiroyuki Ueda, Haru Takehana, President Makiko Nakasone, Ryan Friedman, Weili Materna, Sharon Im, Chris Komai, Joyce Chinn, Mike Okamoto, and Yokko Ueda. Not pictured but came for the clean up are Kathy Ikeda and Derek Furukawa, past president of Gardeners Federation of Southern California. It is important to note that Derek had a conflicting schedule, but instead of skipping the clean up altogether, he came early in the morning to blow leaves on the plaza for us to make our work easier! Now that is commitment and dedication. As part of the beautification project of the plaza, we are planning to install a stone monument to honor Frances with the money we raised by selling the 52 rice cookers Japan Tiger Corporation of U.S.A. had kindly donated last fall and the Rotary District community grants we recently received. The next clean up will be ay 9:30 am on Sunday, April 24. We finally made it to one of our sponsor clubs, Wilshire Rotary Club, on Wednesday, 3/23, to properly thank them for our club banner and the bell that the club and Past District Governor(PDG) Elsa Gillham, had purchased for us as a charter gift. President Pearl Leeka of Wilshire Rotary warmly welcomed us, and PDG Elsa introduced each member who attended the meeting: President Makiko Nakasone, Presideny-Elect Mike Okamoto, President Nominee Tsukasa Watanabe, Secretary Tomoko Omura, charter member Sylvia Ena, our 23rd member Hiro Yokota, the 24th member Weili Materna, and the 25th and the newest member Joyce Chinn. After the introduction, we proudly presented our new club banner, which just arrived, to President Pearl, and in return we received their banner. The Wilshire Rotary meets at the Ebell of Los Angeles, and we were all very impressed with the grandness and the history of the building. The guest speaker, Marc Wanamaker, is a film industry historian, and told us that the small but the very first film company in L.A. was in a building belonged to a Japanese, the Noguchi family in the early 1900s. Next Tuesday, we plan to visit Burbank Sunrise, which has generously donated their $192 Happy Bucks to us, purchased several Tiger rice cookers for our first fundraiser, and presented a big banner banner, the banner we can display the exchanged club banners. Please join us at 7:15 am at the Burbank Holiday Inn on 3/29/16 so we can show our sincere gratitude to them for their kind support for this new club! Little Tokyo, "A Place to Be"
Welcome to Little Tokyo, Los Angeles! In the 1880s, Japanese immigrants began setting up homes and small businesses in what became known as Little Tokyo. Then, over 130 years later, despite the community’s World War II forced relocation, Little Tokyo is back with its resilience, shown in its cultural economy, institutions, small businesses, and connections to contemporary Japan. It owes everything to the strong community fabric passed down from generation to generation. "Kodomo no tameni" or for the generations to follow, this fabric forms the backbone to Little Tokyo’s significance as the symbolic hub of the southland’s Japanese Town, one of the four remaining Japan towns in the nation. It is multi-generational and multi-cultural, rich with arts and culture, and expressed through civic traditions like the Nisei Week Parade. 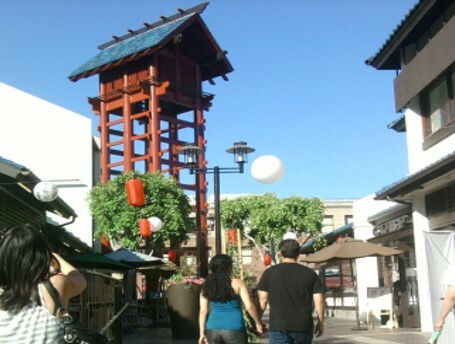 What you can find in Little Tokyo; Through redevelopment era, the community strived to preserve its historic characters. As you walk the First street, you are welcomed by the streetscape of federally preserved building. Rotary Club of Little Tokyo meets in one of these building called Far East Cafe (aka Far Bar) with the large "Chop Shui" sign. This is where people meet, dine and connect both before and after the war relocation. You will see the "Yagura" or fire-watch-tower across the street from Far East Cafe building rebuilt exactly according to the old Japanese design, twice with wooden tembers and later replace with steel, yet maintaining as the welcome place of Little Tokyo. Frances K. Hashimoto Plaza is at South of Second street in Little Tokyo between San Pedro and Central. It is at the cross walk from Japanese Village Plaza. Meter parkings are free on Sundays! Frances Kazuko Hashimoto (August 26, 1943 - November 4, 2012) had been a community leader involved heavily in development of Little Tokyo in all facets of community; business development, cultural introduction, preserving traditions and saving one of the last surviving Japan Towns from being diminished and wiped out. Everybody wentbroken-hearted when we heard the sad news of her passing, but the community decided to treasure her accomplishments and dedicate a central area of Little Tokyo as "Frances Kazuko Hashimoto Plaza." Her family owned the Mikawaya-Wagashi, a traditional Japanese confectionery since 1910. Frances was born in the Poston War Relocation Center during the World War II incarceration of Japanese and Japanese Americans. After the war and their release from internment, her parents reopened Mikawaya in Little Tokyo on December 23, 1945. In 1982 Frances became the first woman to chair the Nisei Week Japanese Festival. One of the biggest "ethenic-based" festivals in the nation. She organized fundraising and remained a strong proponent of festival in the face of declining attendance in recent years, arguing that younger Japanese Americans needed to remain aware of their cultural heritage. She arranged for the festival's annually crowned Nisei Week queen and princesses to attend an exchange in Nagoya, a sister city of Los Angeles. Frances also pushed for stronger ties between Little Tokyo and Nagoya's main business association to form an alliance. Frances served as the President of Little Tokyo Business Association (LTBA) from 1994 to 2008. She actively sought to preserve the character of Little Tokyo and oversaw the redevelopment of the neighborhood, including signage, housing, and security. Former Los Angeles City Councilwoman Jan Perry later noted that, "She worked very hard to protect the history, integrity and identity of Little Tokyo as the largest Japantown in California. She was also a member of the boards of several Japanese American organizations, including the Japanese American Cultural & Community Center (JACCC) and served as the vice president of the Little Tokyo Community Council. In the spring of 2012, the government of Japan awarded Frances Kazuko Hashimoto the Order of the Rising Sun, Gold and Silver Rays, for her contributions to Japan–United States relations.